What do you get when you pair an ordinary plastic bottle with water, glitter, paint, sand, beans, or even toothpicks? An easy DIY toy, a great way to recycle, a crafty project, something to entertain the kids–How about all of the above! Sensory bottles are a great quiet toy for little ones to explore during those in-between moments—in the car on the way to the grocery store, at home when you need something to occupy their hands, or in the stroller when you’re on the go. At its most basic level, a sensory bottle is a container with cool stuff inside. Sounds easy, right? Here at the DMA, we have quite a collection of sensory bottles that we use for the Art Babies and Toddler Art classes and the monthly First Tuesday event for preschoolers. Some bottles are great noise-makers; others are simply mesmerizing to stare at. For today’s DIY, we’ll get the low-down on how to make a sensory bottle and then take on the challenge of making bottles inspired by art in the museum. It might seem like it shouldn’t really require a complicated set of instructions to make a sensory bottle. Easy, right? However, there are a few things to take into consideration that might not seem so obvious. Containers. Any sort of bottle will probably do, but I’ve learned to take a minute to think about who will be using the sensory bottle and what will be inside. I strictly use plastic bottles and jars, so that there is no safety concern when the bottle inevitably gets dropped. I also vary the sizes I use. Babies need smaller, lighter bottles that are easier for them to pick up and hold (think of the mini water bottles you see in kids’ lunchboxes). Older children can handle slightly larger bottles. If a bottle will be holding liquid ingredients, make sure that the plastic is durable and strong. I prefer using bottles with wide openings so that small toys and objects can fit through the bottle neck. Make sure your bottle has been thoroughly cleaned and is completely dry before filling it up. (If the label gives you any trouble, use an adhesive remover like Goo Gone to remove it and get rid of the sticky stuff). Contents. Basically, anything goes when it comes to contents. Consider how your child will play with it—do you want a noisemaker or do you want to explore how colors mix? Do you want something that has a hide and seek element to it? Here are some of my favorite combinations. Closure. Sensory bottles are not meant to be open, so run a line of strong adhesive around the mouth of the bottle before permanently screwing on the plastic cap. My favorite glue to use is E6000. 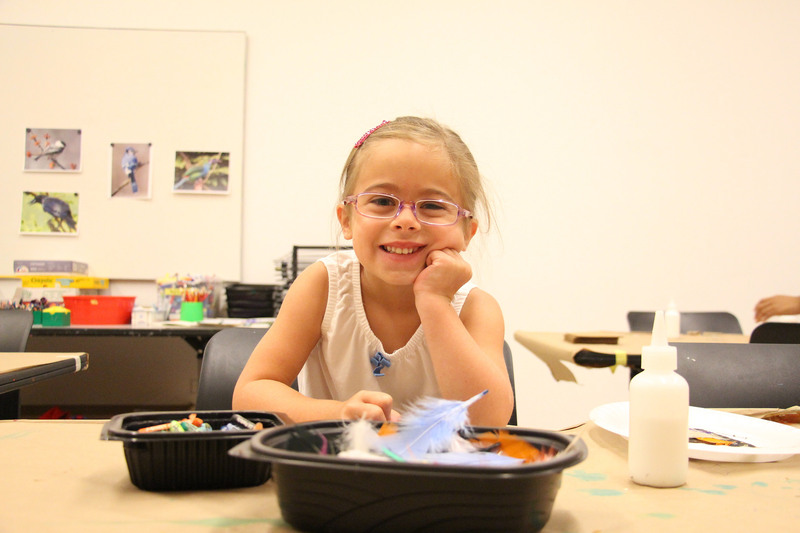 Now for the DMA Sensory Bottle Challenge—extend your Museum visit to at-home play by creating a sensory bottle inspired by a favorite work of art. Use a work of art your child has expressed an interest in as a starting point. Pay attention to the colors, shapes, lines, and objects you see in the work of art and then make a list of things you could fit into a bottle. Here’s what I came up with! By playing with a sensory bottle, your child is gaining experience with all kinds of “big kid” concepts—gravity, density, color mixing, viscosity, cause and effect, and so much more! But more importantly in my book, they are having fun. Play on! Last summer, resident kid whisperer, Leah Hanson, asked me to step in to teach one of her Toddler Art classes. I had observed Leah’s Early Learning programs in the past and thought it would be a cinch. After all, Leah made it look easy! 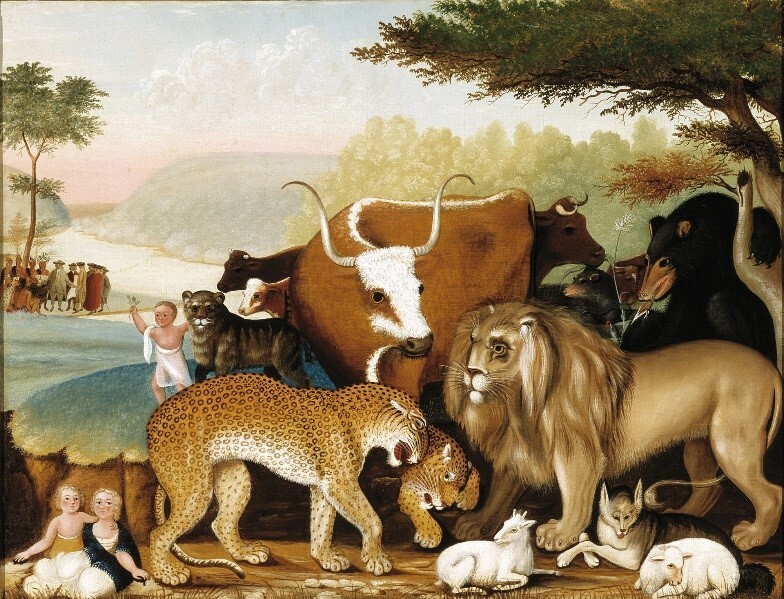 Her classes were like the scene of Edward Hicks’ The Peacable Kingdom. Teaching her class would be a breeze! Right? There was nothing “peaceable” about the scene that ensued. In fact, it much more closely resembled Michelangelo’s Torment of Saint Anthony, on view at the Kimbell Art Museum in Fort Worth. Deeply humbled by the experience, I returned to Leah’s classes to watch with a much more observant eye. While she made the classes look easy, Leah was carefully employing mindful techniques to help her class go smoothly. Any child who has ever taken a class with Leah is ready to tell you, “We have oils in our skin that are good for us, but bad for the art. That’s why we don’t touch the art!” Give the agency of rules to the child by asking them to help you be the protector of the art. With a group of excited children, it can be tempting to raise your voice level to be heard over them. This is a downward spiral. As you get louder, the kids will also get louder and pretty soon you will be at a full cacophony. Instead, lower your voice until you’re in a whisper. The kiddos will quiet down to hear your “secret” information. Think back. Way back. Remember when your teacher would tell you to fold your paper “hotdog style” or sit “crisscross applesauce” and you knew exactly what she meant? Especially with toddlers, it’s important to know that you are being understood, not just heard. Don’t know kid lingo? Befriend an elementary school teacher to teach you the ropes! Instead of trying to interpret a child’s artwork on your own (and risk misinterpreting it! ), ask them to tell you about their work of art. You will be amazed by what you find out! 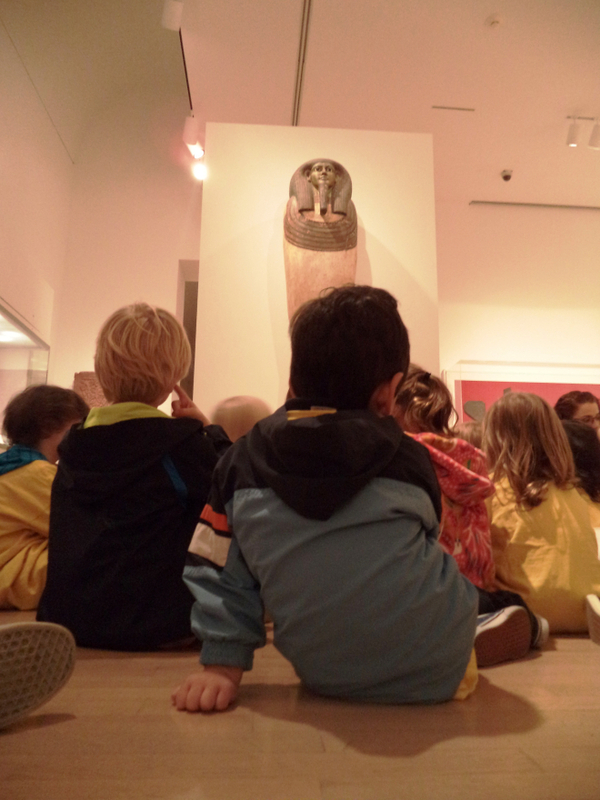 Museums are often thought of as solemn places, where education takes precedent over entertainment. 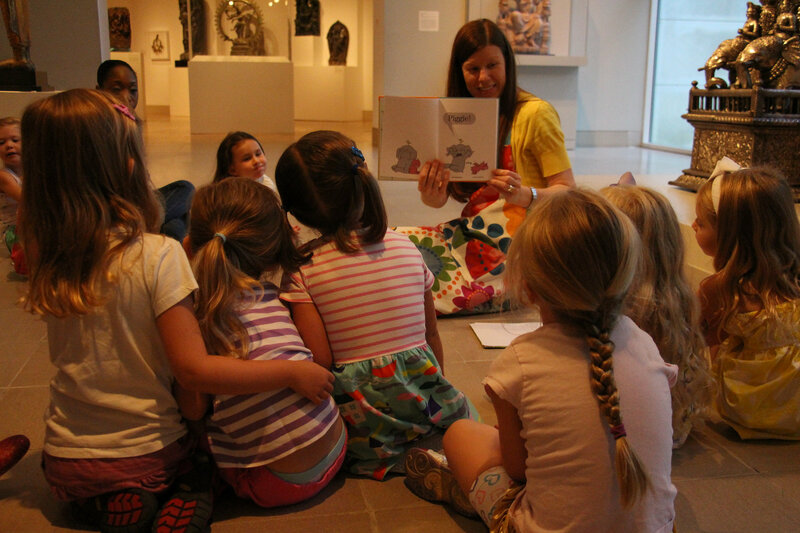 But at the DMA, we believe that play is important too! Cognitive research has revealed that play is the central device for exploring and learning, developing new skills, and making connections with others. Playing thoughtfully with children will also help nurture their natural curiosity and creativity. Instead of saying, “That’s a great painting” try to take a closer look at the child’s artwork and find a specific quality to praise, such as “I love how you combined straight lines and zig zag lines in your painting”. This will encourage you to look more closely at the artwork and the child will appreciate your attentive eye. I returned to the Early Learning programs with these tips and tricks and was amazed at how well the next class went. Practice Leah’s approach and you, too, will be kid whispering in no time! 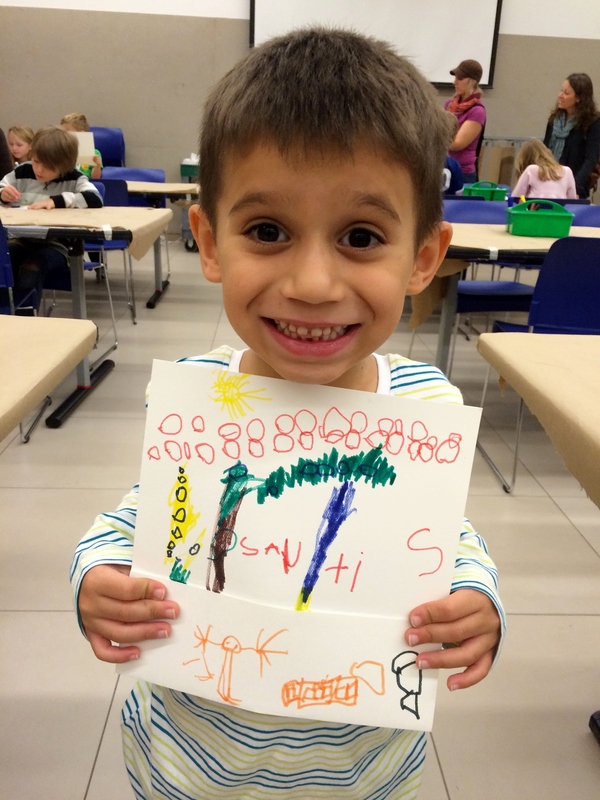 In our family classes here at the Museum, we try to make sense of the art in more ways than one! 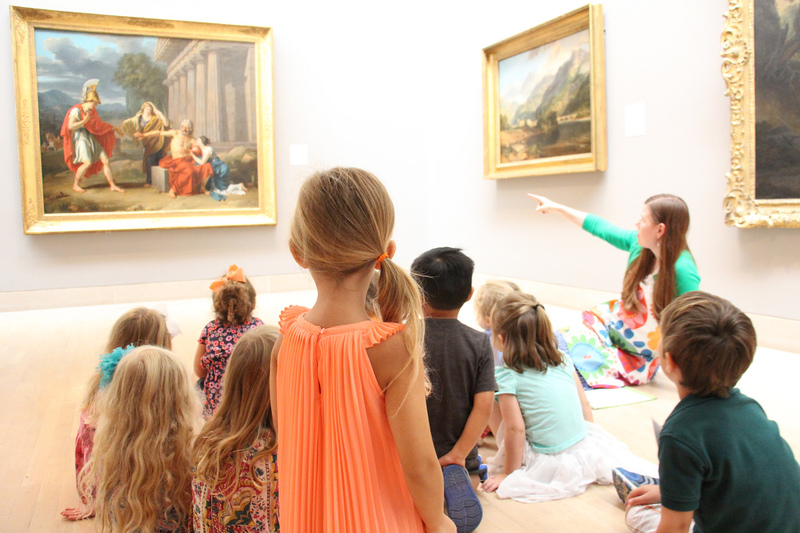 Whether it’s through tactile objects that mimic textures we see in a painting, or listening to music that inspired certain works of art, we do our best to find creative ways to engage more than just our sense of sight when exploring the galleries. For this month’s Art Babies class, we kicked it up a notch and focused on our sense of smell. Since babies already naturally rely on the five senses—sight, smell, taste, touch, and hearing—to learn about the world around them, they were the perfect audience for this sort of experiment. For me, though, it was a fun challenge to imagine smell as a pathway for exploring art. How could I bring smells into the galleries that were both baby-safe and art-safe? And how could I be playful and engaging in my approach? My solution—puppets and spice jars! We began with a story featuring Jack the dog, inspired by Claude-Joseph Vernet’s painting A Mountain Landscape with an Approaching Storm. Jack smells something new in the air and sniffs from one furry friend to the next trying to discover what the smell could be. I used a loveable puppet to bring the story to life, and Jack quickly became fast friends with our little visitors. Several wanted to hug and kiss him, but they also imitated the puppet’s sniffing, and as the story progressed, more and more babies would scrunch up their noses and make sniffing noises along with Jack. (The little one pictured above was one of my most expressive sniffers!) When Jack finally discovers that his mystery smell is the scent of rain, the children and their caregivers made their own discovery too—finding a little dog in Vernet’s painting and noticing the ominous clouds in the top corner of the landscape. Now that we had planted the idea of using smell to better understand what we see, families set off on a smelling adventure through the galleries, using repurposed spice jars filled with a variety of scents—from apple blossom and rain to fresh hay and mountain air! Babies sniffed, shook the bottles like rattles, and stuck them in their mouths. Adults searched for paintings with objects that matched the smells. 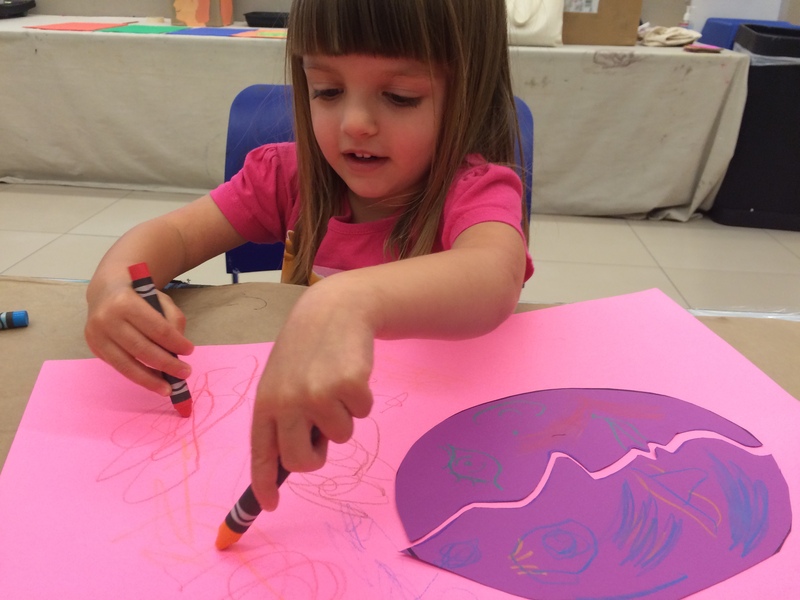 Together grown-ups and children found new ways to experience art. 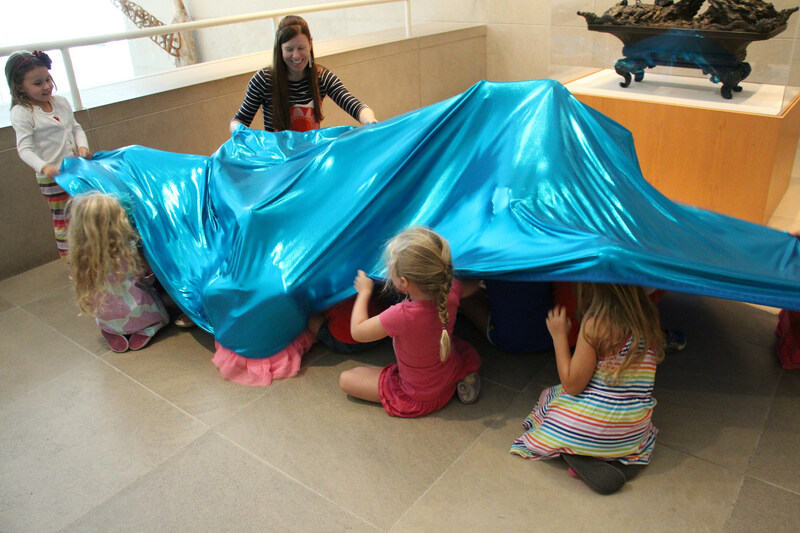 Before the shrieks of delight and giggles could dissolve into tears or frustration at not being able to touch, we left the galleries and made our way to our sensory play stations. Here, any and everything can be picked up, mouthed, dropped, smelled, rolled, bounced, and more. And for a special smell-inspired play area, we offered the babies fresh flowers, oranges, lemons, and limes to smell and investigate. I do believe that these little ones have quite a nose for art! You can create your own smell-based sensory play at home with recycled spice jars, cotton balls, and scents. I found inspiration from this blog post. Be sure to avoid scents that might create a burning sensation (like wasabi, chili powder, mustard or pepper). My go-to source for unusual scents is the Demeter Fragrance Company. Smells like art to me! Let’s hear it for the kids! This week (April 12-18) is Week of the Young ChildTM. Never heard of it? The National Association for the Education of Young Children (NAEYC) established this annual tradition in 1971 to “focus public attention on the needs of young children and their families and to recognize the early childhood programs and services that meet those needs.” This year’s theme is “Celebrating our Youngest Learners,” and here at the DMA, we love nothing more than doing just that! In honor of Week of the Young Child, I thought I’d share what we love most about the children who have become part of our DMA family over the years. In preschools across the country, teachers often refer to the children as “friends.” So rather than calling out “boys and girls” when it’s time to leave the playground, you might hear someone say “all my friends—it’s time to go!” I often use this language in the Arturo’s Preschool classes I teach here at the DMA. 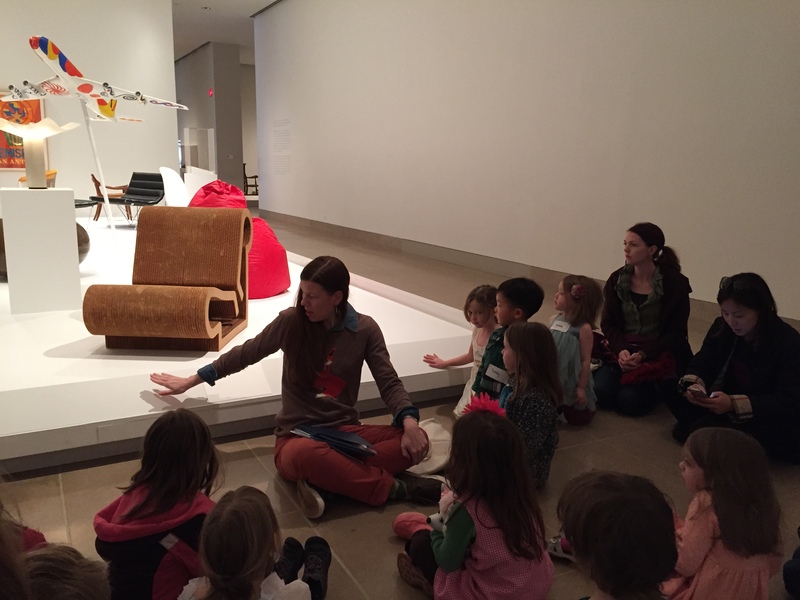 One morning as we were sitting in front of Frank Gehry’s Easy Edges chair, I asked “Friends—what material do you think the artist used to make this chair?” Without missing a beat, a little boy looked me square in the eyes and said, “I’m not your friend!” Ouch! I laughed and did my best to win him over by the time we went down to the studio. I love knowing that four year-olds will give it to you straight! Another admirable trait I often see in the preschool crowd is that they are excited about pretty much anything! 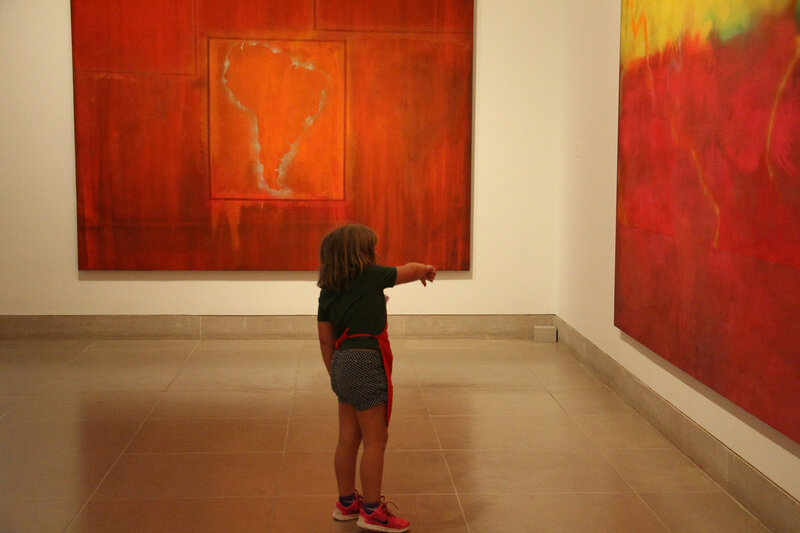 Wherever we go in the galleries, they always want to make sense of what they see and figure out how it connects to their own lives. Once during a class focused on the art of ancient Egypt, I asked the children to imagine what life would have been like with no TVs, no electricity, no cars. One little girl piped up with all the authority of a wise three year-old, “they used cans and strings, right?” She cleverly deduced that if the Egyptians didn’t have the kinds of phones we have today, they must have used tin cans and strings to communicate! She wasn’t deterred by the concept of “long ago and far away”—but instead, she found a way to relate abstract ideas to her concrete reality. Brilliant. (And I just love the image of Pharoah calling down to his court on a tin can). 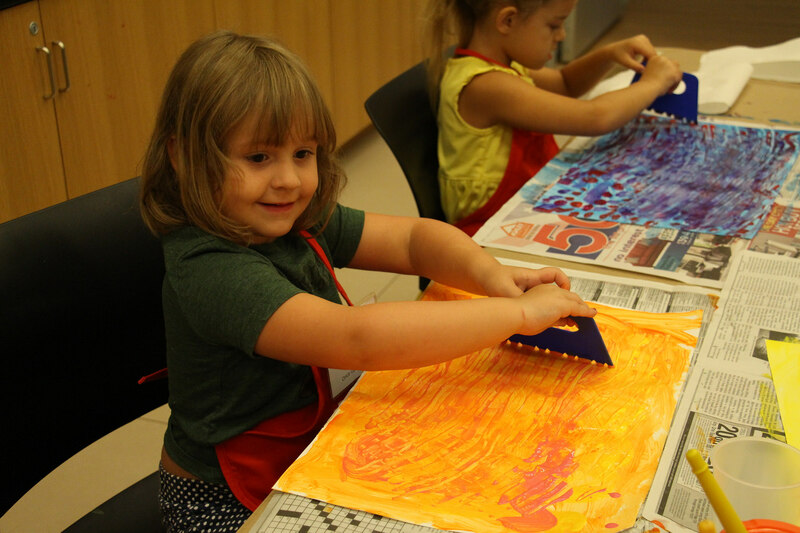 Young children are incredibly willing to entertain new ideas and explore new possibilities in art. While an adult might look at a painting and ask “why is this art?,” children move beyond “why” and ask “how,” “where,” “when” and “can I try it too?” This month we’ve been learning about the artist Pablo Picasso and Cubism. Inevitably, when I show the children a cubist portrait, they giggle and say “that’s a crazy face!” But then they take a closer look and are delighted when they find the nose and ears and eyes and can explain what the artist did to surprise us. You can’t help but feel the buzz of creativity and the energy of little fingers at work when you step into an early learning studio class. Whether they are painting with their feet, concentrating on sewing stitches onto burlap, or experimenting with watercolor, young children are fearless when it comes to making art—something I think we can all aspire to. They dive in, not concerned about doing it “right” or making it look “just so.” They enjoy the materials for what they are, and love to see what paint or markers or paper or their own two hands can do! And when they’re done, they can’t wait to show off their work and tell you all about it. This year, April 16th is Artsy Thursday, so grab your crayons and paint, and celebrate the young children in your life! For more ideas on how you can celebrate Week of the Young ChildTM, check out the resources and suggestions on the NAEYC website.